The Taleban regime has given up its stronghold in Kandahar, marking the beginning of the end of the 61-day war in Afghanistan. A deal brokered by Hamid Karzai, the head of Afghanistan's new interim administration, has helped to secure the surrender of the hardline Taleban's spiritual home. Taleban fighters have been laying down their arms after being bombarded by US planes. General Tommy Franks said troops were blocking fleeing Taleban soldiers. We have engaged forces who are leaving Kandahar with their weapons. However, it has left the Bush administration facing a showdown with the country's new leader over the fate of Taleban leader Mullah Muhammad Omar, who is holed up in the city. Washington has flatly rejected provisions of the deal negotiated by Mr Karzai that appears to offer protection for the Taleban leadership. US Defence Secretary Donald Rumsfeld believes that a deal that will allow Mullah Omar to "live in dignity" would be unacceptable. Mr Rumsfeld has declared that US relations with Afghanistan's new interim government will "turn south" if Mullah Omar is granted any sort of amnesty and that Washington may withdraw its military support and promise of financial aid. The fall of Kandahar will allow US and opposition forces to focus almost all of their resources on the hunt for Saudi-born militant Osama Bin Laden in the Tora Bora mountains south of Jalalabad. Bin Laden is believed to be behind the terror attacks in the US on September 11. After a day of ferocious fighting anti-Taleban forces say they have captured Bin Laden's command centre in his Tora Bora cave fortress. Downing Street has reported that it believes that Ayman al-Zawahiri, Bin Laden's second-in-command and long-time mentor, has been killed by an American air strike. That regime (the Taleban) is effectively now disintegrated. The terror camps can be shut down, and I think that is a fantastic thing. The military authorities in Pakistan have meanwhile deployed helicopter gunships and extra troops along its 2,500km (1,500 mile) border with Afghanistan, hoping to make the border impenetrable. Bin Laden's al-Qaeda forces are on the run after they were forced out of their mountain fortress by a day of intense bombardment. Anti-Taleban forces say al-Qaeda fighters have fled the cave complex and have moved into the mountains of eastern Afghanistan after hours of carpet bombing by American aircraft. The toppling of Kandahar has been achieved after weeks of bombardment with the US and its allies launching air attacks on Afghanistan, allowing the Taleban's opponents to sweep them from power. The fall of Kandahar comes after the Afghan capital Kabul was retaken in November. The Taleban regime first came to prominence in the autumn of 1994 under leader Mullah Omar. The Taleban promised to restore peace and security and pledged to enforce Sharia, or Islamic law. Their birthplace is the province of Kandahar in south west Afghanistan and their target was the feuding warlords known as the mujahideen. The Taleban captured the province of Herat, bordering Iran, in September 1995 and the following year, they captured Kabul - the Afghan capital. 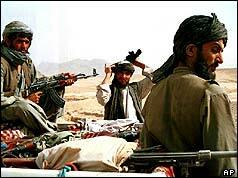 By 1998, the Taleban was in control of almost 90% of Afghanistan. The US declared a "war on terror" in October 2001 and launched an air bombardment by US and UK forces on Afghanistan. President Bush had earlier named Osama Bin Laden as the prime suspect behind the September 11 terrorist attacks on the US. In December 2001, Afghan groups agreed a deal in Bonn for an interim government to be headed by Hamid Karzai. The UN Security Council endorsed the agreement to form an interim government. The leaders of Pakistan and Afghanistan have recently promised they will co-operate to defeat terrorism. Afghan President Hamid Karzai has vowed to crack down on warlords and their private militias after winning the country's landmark election in October 2004. He was declared the winner, with 55.4% of the vote. However, Osama Bin Laden remains elusive to this day as the US war on terror continues following 9/11.